To a true pastor, transparency, honesty, integrity and truth in all things will not be an issue, for the Church of Jesus Christ is the ground and pillar of truth. We should ensure we put in place within our operations as we go about the business of our God, the Father of our Lord Jesus Christ, policies and procedures that will not give anyone occasion to hold us in disrepute. Get the services of professional auditors and accountants that will help you set up accounting processes to conform with standards acceptable worldwide. This government of “Change” is one that was voted into power primarily on its anti-corruption credentials. Everyone agrees that President Buhari is not a corrupt person, and scandals associated with the Panama Papers leak further validates this claim. At a time when people like David Cameron are having sleepless nights, the prime minister of Iceland has resigned, and others are under pressure to also resign, our president is busy working, studying the budget papers with one eye and with the other seeking those he will use as scapegoats in the anti-corruption war, whilst blocking waste and leakages in line with his campaign promise. So it seems. The budget is one document that concerns us all as Nigerians, and the earlier it is passed, the better for our economy. However, a paper that would be of interest to leaders of Not-for-Profit Organisations, especially pastors like me, is a legal document this government is working on called “Not-For-Profit Governance Codes 2016.” Although I am yet to see a copy of this draft law, I only read about it in the news, following a suit brought against the government by a leading pentecostal church. The presiding judge over the matter threw out the case on the grounds that it was a preemptive suit. This led me to conduct some research on what a Governance Code for Not-for-Profit is about. I discovered that a lot of countries have codes like this in place to guide Not-for-Profit Organisations. The governance code provides ordinances that guide the operations of board members, bearing in mind public trust and members’ expectations. For Instance, according to the Irish Code of Governance for Community, Voluntary and Charity Organisations, “Governance refers to how an organisation is run, directed and controlled. Good governance means an organisation will design and put in place policies and procedures that will make sure the organisation runs effectively.” Good governance, when adopted, assures and reassures members that their financial commitment is worth it for they are at peace knowing their money is being properly managed by a well-run organisation. Good governance also promotes transparency in that everyone knows how things are done and why they are done. In a country like Ireland, their governance codes are principle based; that is, it is not a book of rules for what to do, but a code containing a framework that would guide any NGO. What makes the matter worse is the fact that most churches operate a financial policy of absolute secrecy. The average Christian believes that the pastors will account to God what they did with tithes and offerings, hence they care less about pastors giving account for monies received or spent; but we still have those who think otherwise – a number of people want churches to show their books. Whichever way you want to look at the governance code, the main thrust is financial accountability and transparency. This issue is strongest when it comes to religious organisations, especially churches. People see a lot of churches, especially pentecostal churches as one-man shows. They refer to the founders as the “owners” in the same way they refer to Aliko Dangote as the owner of Dangote Group. What makes the matter worse is the fact that most churches operate a financial policy of absolute secrecy. The average Christian believes that the pastors will account to God what they did with tithes and offerings, hence they care less about pastors giving account for monies received or spent; but we still have those who think otherwise – a number of people want churches to show their books. This proposed governance code by the government can be perceived in one of three ways: first, the government, already accused of an Islamic agenda, is hiding behind this law to see how they can get at the church or at church leaders who opposed them during elections; second, the government wants to weaken the financial clout of religious organisations and the influence of their leaders; and third, the government wants to sincerely put in place a framework that will promote financial transparency in NGO money dealings and cut off terrorism financing, curb money laundering and all other financial crimes that can be perpetuated through organisations within the NGO category, since this code will empower government auditors to ask religious organisations to open their books. Let us not forget that if we judge ourselves – meaning if we audit ourselves – we would not fear the government auditors. 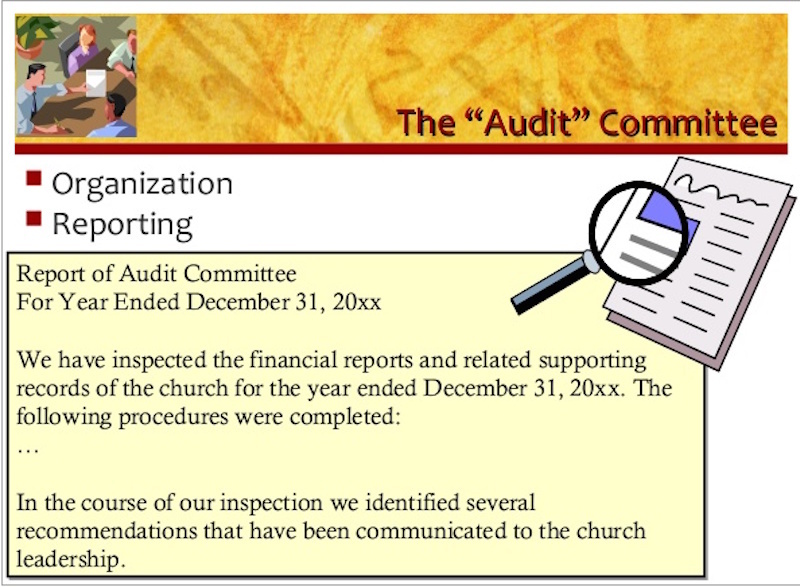 Dear Pastor, prepare, the auditors are coming! In whatever manner this law may be perceived, the message from the body language of this government towards organised religion should bear in mind what is brewing in Kaduna. Pastors, get ready for possible government interference, probing, and probable stringent regulations; or, maybe, outright persecution. The Church of God in Nigeria should be ready for a possible repeat of the policies designed by the Pharaoh that knew not Joseph, all in the bid to weaken the ever growing dominance of the church. Pastors should be weary of the activities of clandestine politicians and policy makers around the corridors of power who can connive to see how they weaken the church without the knowledge of the King, like some men did in Daniel’s Babylon. The church, like Daniel and his friends, must be ready for possible attacks designed to throw her leaders into the lion’s den or fiery furnace. We have seen this already happen in other countries. The best way to prepare is to ensure that like Paul, we are taking every precaution against all forms of scandal. Paul in the letter to the church in Corinth said, “We travel about this work of sharing God’s gift to honour God as well as we can, taking precaution against scandal. We don’t want anyone suspecting us of taking one penny of this money for ourselves. We are careful in our reputation with the public as in our reputation with God.” To a true pastor, transparency, honesty, integrity and truth in all things will not be an issue, for the Church of Jesus Christ is the ground and pillar of truth. We should ensure we put in place within our operations as we go about the business of our God, the Father of our Lord Jesus Christ, policies and procedures that will not give anyone occasion to hold us in disrepute. Get the services of professional auditors and accountants that will help you set up accounting processes to conform with standards acceptable worldwide. Let us not forget that if we judge ourselves – meaning if we audit ourselves – we would not fear the government auditors. Dear Pastor, prepare, the auditors are coming! Sunday Ogidigbo is the Lead Pastor of Holyhill Church, Abuja. You can send him an email at: psun@holyhillchurch.org, or connect with him via Twitter @SOgidgbo or visit www.sogidgbo.com.